« Obama gets it. Nobody understands us. I am too lazy to do the research myself, maybe you guys can help me figure out, whatever happened to…? 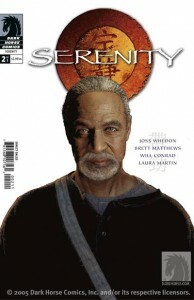 1) Serenity: the Shepherd’s Tale. When Dark Horse announced this three issue mini series that would finally document Shepherd Book’s past, they said it would be out Fall 2008. I have yet to see it listed in there upcoming lists. 2)Savant and Creote. Gail Simone’s run on Bird’s of Prey produced some very cool new characters, such as Black Alice, and Misfit, both of whom are still showing up in the series pages. However my favorite, the duo of Savant and Creote have completely disappeared. Savant is a highly intelligent, extremely unstable, misogynist pretty boy. Creote is his extremely loyal bodyguard/manservant/sidekick/husband? Despite the fact that their first appearance involved them holding Black Canary prisoner, Oracle was able to turn them into allies and ably used their skills to help her ever growing team. Savant eventually fled since Oracle’s reforming of him had seriously disturbed his calm, Creote being completely devoted of course went with him. I assumed they would be back at some point, but that was the last I saw of them. I hope some writer revives them. They might make an interesting addition to Gail’s own Wonder Woman run. 3) The next arc of Sky Doll. Sky Doll was probably my favorite discovery of last year. I even bought the hardback trade when it was released even though I knew there was no material in it other than the contents of the three issues already published. I want to collect it as books. I am dying to know what happens next, but there has been no sign of when Marvel will bring out the second series. This entry was posted by Susie	on Saturday, January 31st, 2009 at 1:10 am and is filed under artist/creator(s), Dark Horse, issues, Marvel. You can follow any responses to this entry through the RSS 2.0 feed. You can leave a response, or trackback from your own site. Delays are such a fact of life for comics readers nowadays. Nothing is dependable, especially the superstar writers, all of whom seem to have other non-comics projects they work on as well. Whenever you seem them on interviews, they always seem to look at the comics work as something they do when they have time between tv series. Of course, the tv series do pay more I’m sure. You’ve just reminded me of things that I would also love to see… but I have no new information about any of them. I’m looking forward to Dollhouse (it should show up on Tivo’s listings sometime today), but knowing Fox’s track record, Joss may be free to pursue his comics work again very soon.